Expert and personalised recommendations for yourself, for your children, family, friends, book clubs, and as gifts. Each recommendation includes an original summary without spoilers and book details. 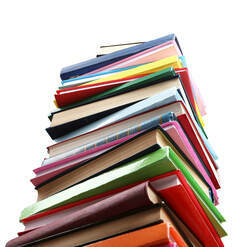 Sourcing and delivery of recommended titles or other can also be arranged on request. Libraries and reading rooms for schools, community centres, etc. Authors, Publishers, Agents, Publicists. . .
Book press kits and catalogues are always welcome and all information sent to me will go on file to be considered for future recommendations. As a lifelong reader and amateur librarian, it seems my becoming a personal book shopper was inevitable. In 2014, after months of honing my concept and services, and creating a website to showcase both, I proudly launched Bookommended: an individual, international, independent business providing book recommendation and sourcing services. Right away, I began sharing my expertise and passion for books with individuals, parents and book clubs. In each case, I took the time to get to know the customer, their wants and needs, in order to personally select titles to surprise, delight and inspire the intended reader/s. Example results of my unique approach can be seen in the pages of Thailand-based magazine, Wanderlust, where, as columnist of 'The Book List', I wrote original summaries on hand-picked titles to appeal to their readership. To celebrate Bookommended's first anniversary, I redesigned the website for a fresh look and feel. The republication of the site coincided with the release of my newly developed consultancy services for those embarking upon large-scale book projects. One year later, the online shop front of Bookommended was moved from a separate domain to this page. To this day when it comes to books, I am here to help, person to person, imagination to imagination.